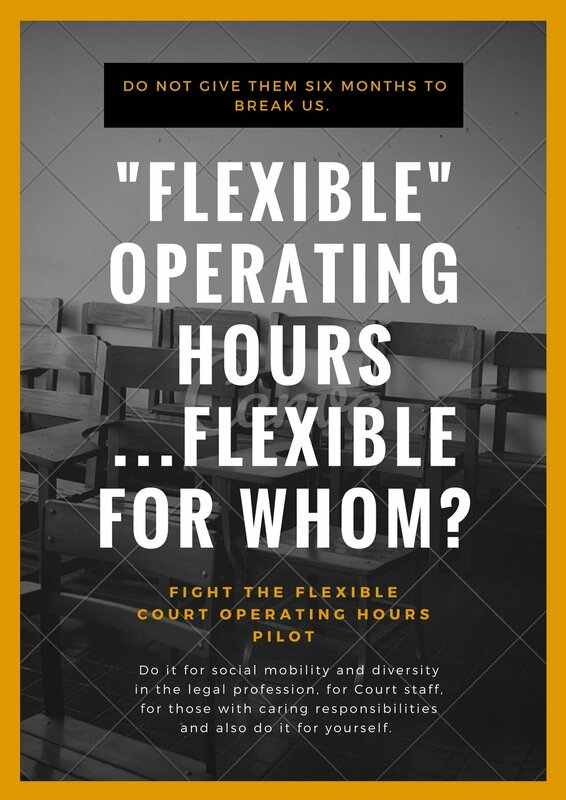 The Haldane Society condemns the (In)Flexible Operating Hours Proposals (“FOH”) for criminal and civil courts in England and Wales. We refuse to allow 6 months for the pilot scheme to wreak havoc on those most vulnerable at the Bar and those working in criminal firms or working as court support staff. The FOH pilot scheme seeks to extend court sitting hours, operating a shift system in some courts. Pilot schemes will operate for 6 months, beginning in September/October 2017. The proposed pilot courts are Newcastle and Blackfriars Crown Courts, Sheffield and Highbury Corner magistrates' courts, Brentford County Court, and Manchester Civil Justice Centre. Crown Courts will sit from 9am, with a second shift from 2pm to 6pm. Civil courts will sit until 7pm and magistrates’ courts until 8.30pm. Criticisms of the scheme have been raised by the Bar Council, the Law Society, the Criminal Bar Association and the Criminal Law Solicitors Association amongst others. Chairman of the Bar, Andrew Langdon QC, has noted that working the proposed hours would be 'almost impossible' for those with childcare responsibilities. As these duties continue to fall disproportionately on women, female members of the Bar are likely to see the biggest impact on their practice. This is a backward step in terms of diversity and equality of access. It is an accepted fact that retention of women and ethnic minority lawyers at the Bar is unacceptably low, a position rendered more bleak by the impact of this scheme. These proposals will increase the already excessive financial pressure on criminal firms, particularly small practices. Many junior barristers are already warning of the likelihood that they will be forced to leave the Bar should the proposals come into force. It has been argued that the scheme is only a pilot and so should be allowed to proceed. –However, the risks of the pilot can be seen at the outset and are so harmful that the pilot cannot realistically begin: 6 months of an attack on diversity is 6 months too many, and is an attack from which some people’s practices may not recover. The impact will be felt long before the pilot scheme concludes. The likely long-term results are further closures of firms and more criminal barristers leaving the Bar. The problems will be particularly stark for those with children, caring responsibilities and without family support - precisely the practitioners for whom the Bar should be increasing its support. There is a mental health crisis at the Bar, arising in large part from poor pay and poor working conditions many barristers face. For women and ethnic minorities, proposals for well-being and mental health support are futile in a working environment that renders it impossible to maintain a practice. Work-life balance is a concept unfamiliar to most barristers. The improbability of being able to prepare cases when sitting late, beginning early and caring for others is a further step in the wrong direction. The Bar Council Protocol for Court Sitting Hours recommends a basic structure of sitting hours between 10am and 4.30pm, save for emergency hearings, long cases, or in particular circumstances with no less than 24 hours’ notice. Whilst there is much work to be done beyond these proposals, Haldane supports this structure as an initial step towards enabling genuine diversity and equal access at the Bar. The Haldane Society supports those barristers who refuse to have cases placed into split shift courts, even if this is on the basis that their working hours are already too high or that the case may be returned to someone in chambers who may have caring responsibilities. The Haldane Society also supports those barristers who intend not to retain instructions when a criminal case is put into a split shift court. The Haldane Society supports those chambers who have agreed not to accept returned cases in split shift courts. The Haldane Society supports workers at the criminal Bar, criminal solicitors, paralegals and court support staff. If any workers are struggling financially as a result of the proposed action i.e. from returning work or not accepting returned work, please contact us and we may be able to assist. If there is any other way we can assist with supporting workers in the criminal justice system as a result of FOH proposals and resultant action, please let us know at vicechair@haldane.org. Anything discussed will be on a private and confidential basis.